National IT Aptitude Test (NITAT) is India's largest and most widely recognized IT aptitude test conducted across more than 200 cities. Specially designed by NIIT- leading Global Talent Development Corporation and Asia's largest IT trainer, NITAT is a 100 minute objective type examination organized annually to enable students and graduates ascertain their aptitude for the IT industry. 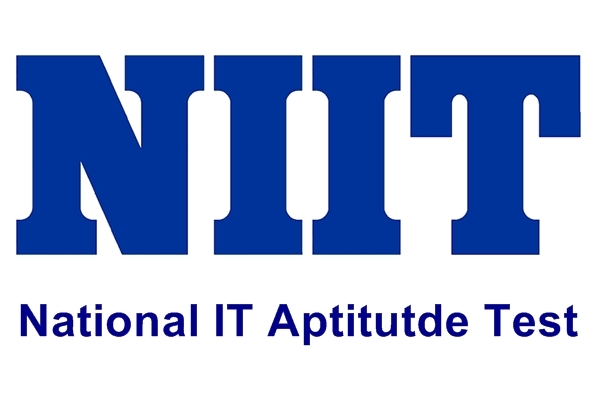 NITAT assesses the functional abilities and behavioural traits which is crucial to gaining a foothold in the IT industry. Introduced in 2004, NITAT is skillfully designed to test the students in all aspects required to make a successful breakthrough in the IT industry. NITAT will help to determine the IT aptitude of students from varied educational backgrounds including students of BA, BCom, BSc, MCA and Engineering. NIIT will award a range of benefits to NITAT toppers, including special recognition certificates to the top 30% merit list candidates and encourage their pursuit of a career in IT. Students who have completed Class 12. NITAT is a 100 minute objective type test of reasoning, comprehension, data interpretation skills and behavioural traits. NITAT does not require previous knowledge of computers and does not require to have a background in IT or engineering. The test assesses functional abilities and behavioural traits that make up IT aptitude. Functional abilities assessed in NITAT are Numerical Ability, Logical Reasoning, Problem Solving and Verbal Ability (including English Comprehension). Behaviourial traits assessed are Result Orientation and Teamwork. They are based upon NIIT's extensive research at Centre for Research in Cognitive Systems (CRCS) and through extensive industry interactions. Score Cards : Every student undergoing the test will receive an IT aptitude score card combining the six dimensions of personality, along with the mean score and the highest score of all candidates appearing for NITAT. A qualitative interpretation of this score is also provided. The score card will have the relative position (rank and percentile score) on overall IT aptitude on a national, zonal and state level. NITAT assessment scorecard also assesses their potential for success in specific IT domains like networking, software, hardware, server administration and much more. Candidates can directly register for the NITAT by filling the online NITAT application form on the website www.niit.com/NITAT. To receive the NITAT Hall Ticket, you can make the payment of the requisite amount of the application fee either online or at your nearest NIIT centre. Candidates can also have the option of registering for NITAT at your nearest NIIT centre along with payment of NITAT Application fee and 2 passport sized photographs. The applied candidates will receive an authorized NITAT application number specifying the test venue, test time slot and other details. Usually NITAT will be held in the month of February. List of examination centers can be had from the website.